In celebration of Kitchen Cow’s Second Anniversary, I’d love to present the favorite bento entries as chosen by you guys. Some of these are my favorites as well, while some are surprise entrants. Still, I love hearing your feedback so tallying everyone’s comments was a fun, albeit rigorous task. So, here they are, your favorites! Bento 181 Picnic Obento. 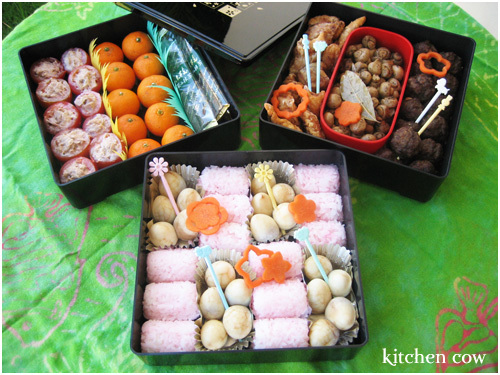 A relatively recent bento entry, this one was prepared for a picnic celebration with a couple of friends. This is the largest, and most difficult bento I have prepared. Aki’s Bento. 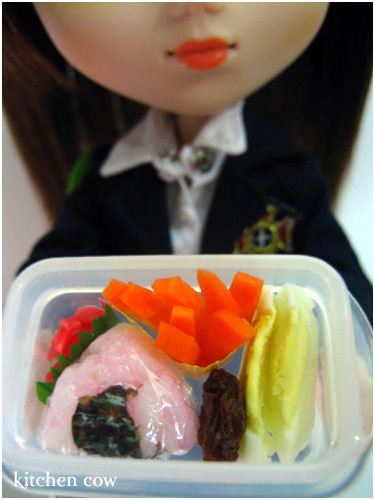 Though not a real bento per se, Aki’s bento ranked highly probably because of the cute factor. Made of real food, the only thing unreal about it is the size. It’s barely 2 inches high! 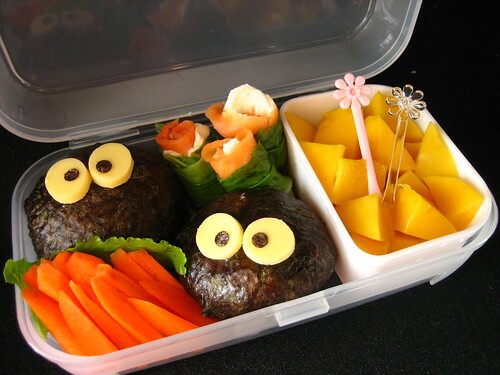 Sea Monstaaars Bento. Inspired by mutant fishies and monsters from various cartoons that I guess a lot of you folks find endearing. Along with his shrimpy babies of course. A surprise entry for me, or at least, I didn’t think it would rank this high. Spirited Away Bento. A shoe in entry because who could resist Hayao Miyazaki’s soot sprites? Plus, imagine enjoying a helping of smoked salmon and cream cheese rolls with them. Mmmmmm…it’s something I love so much, I chose it to adorn the site’s banner! They’re All Eyes Bento. A bento where everything lives! Or at least, have eyes. As I’m sure you can see. ^_^;; For me, what’s more especial about this bento is because this is when I hatched the brilliant idea of using drinking straws as a cutter of sorts for bento eyes. Much much easier to make cute, eyes now. 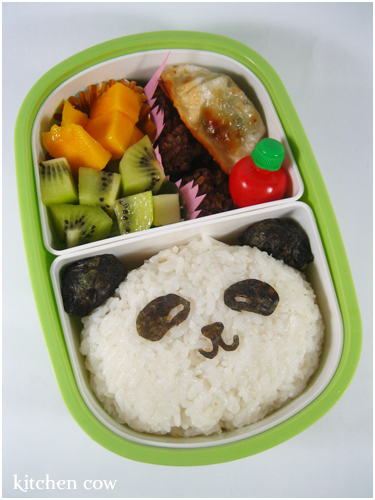 The Return of the Kyara-ben, aka Giant Onigiri Panda bento. I guess everyone loves Pandas (but not as much as multi-eyed mutated sea creatures). 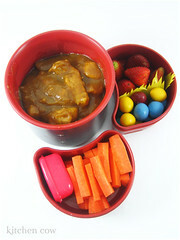 CCS Keroberos Bento. Most everyone commented the same, they loved how the sauce bottle was incorporated in the design. The truth is, it was done spur of the moment—he really looked like he wanted to grab the strawberry for himself! Though I worry what will happen if he actually bites into it because it was full of olive oil! Curry Omuraisu Bento. Another surprise entry for me, because it’s not a cute bento. 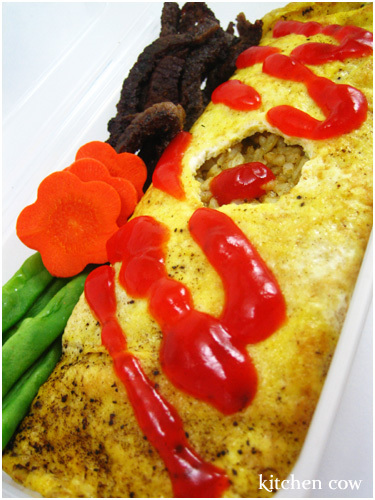 But I guess everyone’s love for Omuraisu came through, hence the need to choose it. Cute versus hearty home cooking. Who ultimately wins? You decide. Mice, baby dragons and earless painters? The first two, I’d understand, but earless painters? There you have it, the top 10 Reader’s Favorites. 39 more entries were mentioned during the survey but these ones which are included in the list figured the most. If you’re curious about which were the other bentos users liked, the actual survey / contest is here. Thanks for participating and thanks for all the anniversary greetings. And yes, the most important thing, I know. We have a winner! Congratulations to your anniversary and to the winner! Oooh, congratulations to the winner, and to you! Happy Anniversary! Happy Anniversary! to Kitchen Cow! 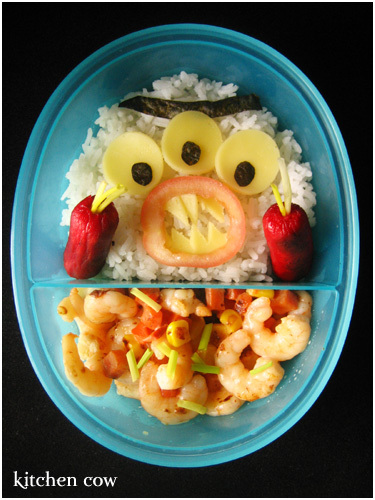 You’re such a great food/snack In”BENTO”r! Congratulations!! What a very fitting list to capture your best in two years! :3 Woohooo!! Happy Anniversary and congrats to Jonelle! you’re such an inspiration, kaoko. and yey to more contests! I just wish I actually didn’t get too absorbed with work that i missed all the bento give aways. Just stumbled on your site. This site is great. Now I know what to do to make my office lunch box much more fun! Thanks for the greeting! Most of my bento paraphernalia are from Daiso / Japan Home, New Hatchin Grocery and Co-op too, but stocks tend to vary from time to time. I recommend repeat visits to nab what you want. What exactly are you looking for? Glad you made it here, I hope it helps you with your office lunch box exploits! That compilation picture looks so good. By the way, Kaoko, you ever thought of making it into a desktop picture? These are so adorable and inspiring. I’m jsut starting out, but I’m totally obsessed. Hopefully mine will be as cute as yours someday. Thanks for the posts! Thanks as well Julie, I hope you find the site useful. Hello! It’s my first time to visit and I have to thank a friend of mine, MrsPartyGirl, for leading me here. 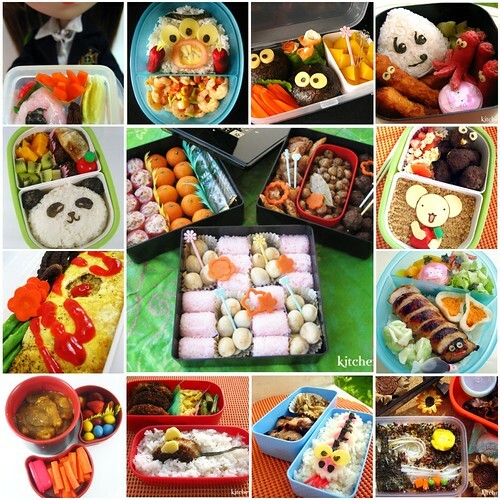 😀 May I just say that I love your bentos and I am now so inspired to be more creative with how I prepare my daughter’s lunch. My daughter’s 4 and the only food she wants to eat for lunch in school are siomai and dumplings. If those are the contents of her lunch containers, she’s sure to eat them all. 😀 Thank you for giving me plenty of ideas! I hope to post whatever I come up with on my blog, too. I’m now on a mission to buy more food containers…bigger and more attractive ones! Hee hee! More power to you and may you continue to inspire moms like me and other food/cooking enthusiasts! Glad you’re liking it here, Munchkin Mommy! So nice that you can pack bento for your daughter. 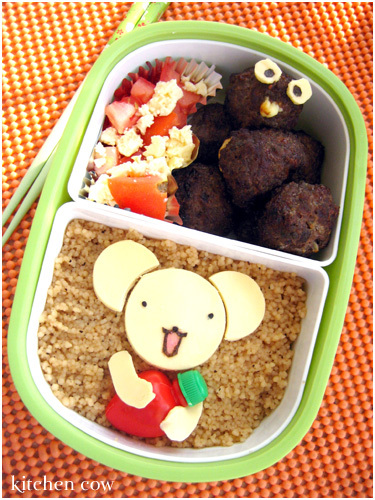 When I have children (eventually ^_^) I know I’ll go nuts cooking lunches for her / them. I hope you don’t go overboard with buying food containers though because honestly, heehee, I end up spending more than I should over them. So difficult to resist buying the cute ones, no? 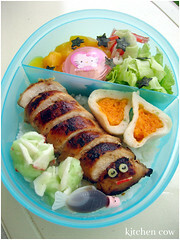 first i was interested in just the cute bento accesories, and how to make lunches more fun to my son..
mmm nom nom nom. Congrats to the winner!!! Hello! I just stumbled upon your site by accident and I am super impressed with all the photos and blog entries. 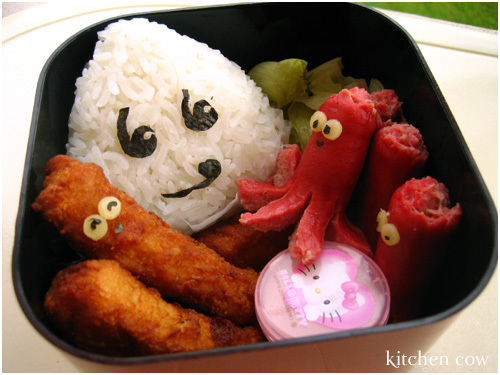 Wow I love your bento art. Seriously. Great job and please keep it up!! Thanks Julianne! It’s just unfortunate that I don’t have time to prepare bento lately, but I do hope to get back to doing it. Thanks and I hope you keep visiting.